Salah satu tempat wisata di bogor ini memang menarik sekali untuk di kunjungi, jika Anda sedang liburan ke Kota Bogor cobalah untuk berkunjung kesini dan nikmati suasana alam yang masih asri disini. Selamat Liburan fajar yusuf ucapkan :). CICO-Cimahpar Integrated Conservation Offices is an educational area and also a place for an approach to nature conservation, located in the Village Cimahpar, district. North Bogor, Bogor City. Tourist area this one has several facilities as supporters such as the office building, apartment, dorm (dormitory). Here also there is an orchard, a vegetable, and a variety of medicinal plants. These attractions are also equipped with rock climbing, other outdoor activities, and there is outbound area. This area was built to be dedicated to conservation purposes. Cimahpar Integrated Conservation Offices have built on land which covers more than two hectares. For those who want to visit, address information is located on Jl Hero Member Wiradireja No. 216, North Bogor which has existed since five years ago. Cimahpar Integrated Conservation Offices (CICO) has always guaranteed to the visitors who come to relieve fatigue in the region is still very so beautiful and lush, it makes quite a lot of visitors so feel welcome to linger in these places. 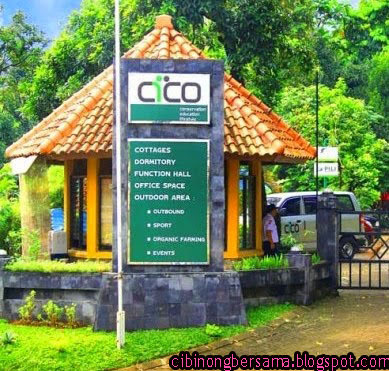 As a green area with contours of the land is hilly, CICO provides about 10 units of cottage or bungalow as one of the tourist accommodation that is comfortable for the visitors who love the tranquility and beautiful nature. Each cottage is in CICO consists of 3 bedrooms which are divided into two: 1 master bedroom has a private bathroom, while two other rooms have shared bathrooms. In addition, every room that are here are also equipped with air conditioning (AC), bathroom equipped with a shower that can release hot and cold water and toiletries are complete. CICO facility owned it, offered to visitors at competitive prices. Dormitory / room / hotel: Rp 90.000, - (120 beds) for a minimum of 20 people. Rent a meeting room in CICO: Rp 650.000, - for Julang Room and hornbills Room. One of the tourist attractions in Bogor is indeed interesting to visit, if you're on vacation to the city of Bogor try to visit here and enjoy the atmosphere of beautiful nature here. Happy Holidays :) fajar yusuf say.